Four new stands have been built at Deepdale in recent years. The new stands offer uninterrupted views of the pitch from all seats. The stands all have players images built in to the seating which makes a nice change to the usual club initials. 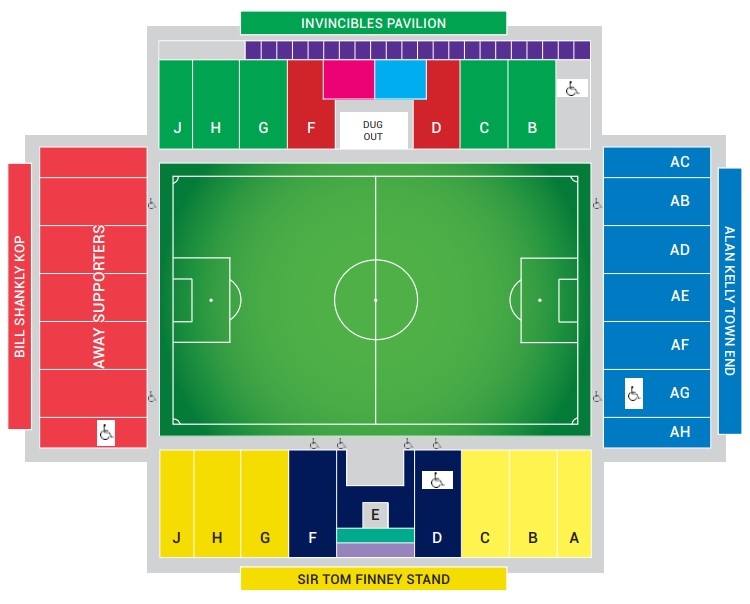 Whilst it doesn't follow the generic modern bowl-shape design, by having open corners, it manages to maintain the traditional appearance which is perhaps better suited to a club with Preston'’s history, whilst still incorporating all the features of a new ground with added leg room and easy access in and out. Visiting supporters are situated in the Bill Shankly Kop stand behind one of the goals. This stand is usually shared with the home fans but when a larger following is expected the whole stand can be given over to visitors. A maximum allocation of 6,000 is available but generally this is kept to 3,000. Views, facilities and leg room are all fantastic and the refreshments aren't bad either. Prices are very reasonable and staff and stewards are generally friendly and talkative. In the town centre you'll find the customary Wetherspoons and many other pubs but the closest to the ground that allows away fans in is There is the Deepdale Labour Club, behind the Town End stand. There are fast food cabins situated around the perimeter of the ground and a McDonalds and Pizza Hut close by on the Deepdale Retail Park, just off Blackpool Road which tend to get really crowded on a match day. Parking is available in the streets surrounding the stadium if you arrive early enough. Alternatively, at Moorfields Special School parking for cars is available for £3 a vehicle. The car park is manned by volunteers from the school and all proceeds go into school funds. The school is situated just past the stadium and is signposted. The nearest / closest train station to Preston North End's Deepdale Stadium is Preston. The railway station has 2 exits and both lead you onto the main shopping street, Fishergate. Turn right and go straight along here for a mile until you see the prison on the other side of a dual carriageway. If you cross the dual carriageway and reach the prison you will see a pub across the road on the corner of Deepdale Road. 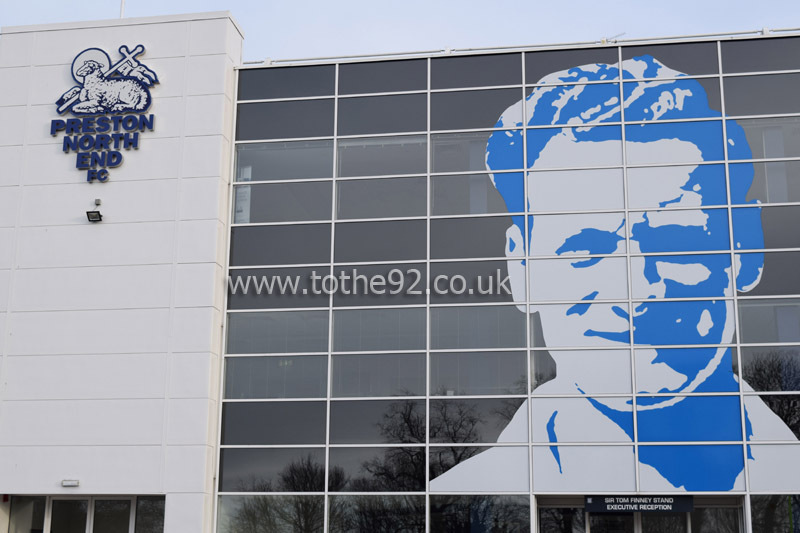 The ground is about half a mile along Deepdale Road and will appear on your right hand side as you walk towards it. Travel: I used the coaches from Bristol. The police escorted us from the motorway to the ground (vice versa afterwards. The coach parking is right outside the away end so nice and easy. Refreshments: I used the finneys bar in the ground, rather small and expensive but a good atmosphere between home and away fans. Impressions: Very impressive i must admit. nice little bar on the way int. A little intimidating as there was a huge police presence and a sniffer dog as you go in. it was a no smoking ground aswell which sucked and the stands were very steep.The atmosphere was electric as you would expect for a crucial top of the table sell out clash with 3000 city fans and the 12000 preston fans really getting behind their teams! Facilities: Toilets were a little small and the bar queues a little long but that's about normal. good legroom and vie though! Exit: Easy, the police took us through Preston straight back on the m6 for the 4 hour slog back. Enjoy: Very much so and i will go back next season when both teams meet in the championship. Have you been to Preston North End's Deepdale? To tell us about your experiences and to feature on the site, simply complete the fans review form below!